Dr. Gwenetta Curry is an assistant professor in the Gender and Race Studies Department. 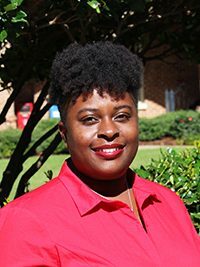 She completed her Ph.D. in 2016 from Texas A&M University in Sociology. Her dissertation, “The Relationship between Education and Obesity among Black Women in the National Health and Nutrition Examination Survey Cycles 1999-2010,” revealed that education does not improve the health of Black women in the same manner as their white counterparts. In 2007, she completed her Master’s Degree from Southern Illinois University in Dairy Sciences which focused on the effects of linseed oil and omega-3 fatty acids in the diet of grazing dairy cow’s milk. The results of this study demonstrated that increasing the levels of linseed oil in dairy cows diets leads in higher levels of conjugated linoleic acid in milk. From 2007-2009, she worked as a Research, Quality and Innovation scientist for ConAgra Foods in Omaha, Nebraska. For six years, she created new products and technology for the food industry and saved Peter Pan after the salmonella recall, which earned her the CEO award. Her current research focus on improving the health of Black women and the Black family overall. Dr. Curry’s research areas include: Health Disparities, Africana Womanism, Black Family Studies, Food Insecurities and Food culture, and American Racism.